Nice..is it hard to make one? Usually quilts are meant for display rite? The quilt in the picture was made by one of my clients. I only do the finishing for her ... the top stitching.. on my big machine. 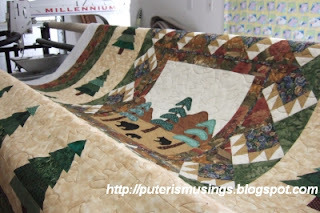 Quilts can be displayed, like hung on the wall, or they can be used as blankets, bedcovers, picnic blankets, whatever! Not hard to make, esp now there are tools that you can use to make it easier to make one.